The two biggest healthcare mergers of the year so far (CVS and Aetna, Express Scripts and Cigna) would be a disaster for consumers. CVS and Express Scripts have already exhibited predatory behaviour without the added power of being part of health insurers. Making them more powerful is hardly an incentive for them to change. The Department of Justice has the power to stop them, and if we don’t, we’ll lose control of pricing in the system in ways we can’t imagine. This year, the pharmacy chain CVS is trying to buy a health insurer, Aetna, for about $US68 billion. At the same time, another health insurer, Cigna, is attempting to buy the country’s biggest pharmacy benefit manager, Express Scripts, for about $US54 billion. Neither of these deals should happen. The companies will tell you these mergers will bring efficiency to the market – that giving them more power over every point between you and your healthcare will also give them the power to lower costs. But we have no reason to believe that. In fact, we have every reason to distrust these companies. A look at what they have done with the power they already have shows that consolidation hasn’t brought prices down. Costs have gone up, margins have fattened, and patients have been left with fewer options. Before these companies get any bigger, we need to understand how they price drugs and services. We need to understand how it seems the American consumer is getting screwed every time, while the companies claim to be saving people money. I’ll offer two recent examples of how these companies already use their power to crush competition and keep pricing confusing and secret. Both have to do with a particular line of business: the pharmacy benefit manager. Pharmacy benefit managers, or PBMs, are companies that act as the gatekeepers between whoever pays for your healthcare (public or private) and drug companies. They have become incredibly powerful, with the three largest controlling over 70% of the US market. Those three are Express Scripts, CVS Caremark, and Optum UnitedHealth, and, for them, business could hardly be better. 3. The insurer that pays for the drug. It can pocket cash all through that process. So where exactly will the incentive be to cut costs healthcare costs? One answer is from its few competitors. We’re seeing this in action already, but, fortunately, some state governments are paying attention. Over the past month, both Ohio and Arkansas have moved to stop CVS from squeezing mum-and-pop pharmacies in their states. CVS Caremark, the company’s PBM, manages Medicaid programs in both states, and in Arkansas it is the PBM for the state’s largest insurance company, according to the Arkansas Times. According to pharmacists in both states, it has used that power to reimburse mum-and-pop pharmacies less and less for dispensing drugs. Some drugs, they say, are being reimbursed below cost, leaving mum-and-pop shops in the red every time they sell them. CVS, which operates Medicaid programs in more than 20 states, has denied all of this. Through a representative, it said it valued its relationship with independent pharmacies and there was a firewall between its Caremark business and its pharmacies. But legislators in both states did not buy CVS’ line. In Ohio, Medicaid has made a rule forcing CVS (which runs four of the state’s five Medicaid-managed care programs) and other PBMs to disclose pricing. That contract begins in July, and lawmakers hope to follow it up with a law bringing even more transparency to the way PBMs do business. In Arkansas, lawmakers passed a law giving regulators more power over PBMs with breakneck speed and bipartisan support. 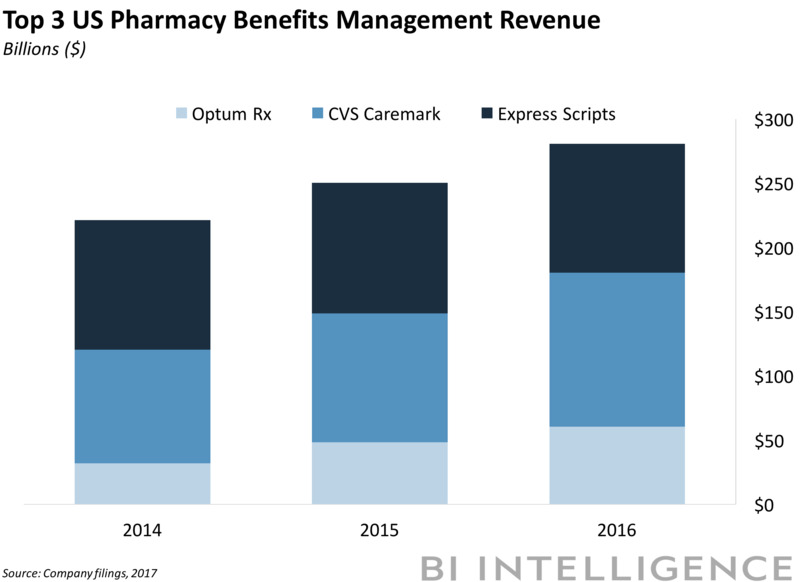 The merger of Express Scripts and Aetna would do more than combine a huge insurer with the biggest PBM. Lest we forget, Express Scripts is also one of the largest mail-order pharmacies in the US. And based on the way it’s done business so far, it has no business getting bigger. Another example for you. The company is being sued by a handful of small pharmacies that accuse it of “stealing” customer information and prescription data with the goal of luring those customers over to Express Scripts’ mail-order pharmacy business. The plaintiffs say it has generated “billions of dollars in illegal profits” by doing this. The plaintiffs run retail pharmacies in Idaho, Tennessee, Indiana, and Oregon – and the reason Express Scripts even has access to the information it is accused of stealing is that those big payers, like the government, won’t strike deals with every independent pharmacy. Instead, Express Scripts becomes a middleman, and pharmacies have no choice other than to contract with PBMs like Express Scripts to obtain the right to fill prescriptions for insured patients and be paid for doing so. Through a spokesperson, Express Scripts said that it “vehemently denies” these allegations, and noted that the first time these charges were filed a judge dismissed the suit. But there’s more. Earlier this month, citing copyright infringement, Express Scripts had DocumentCloud – a service that lets people publish documents to the web – remove a template of one of its contracts from the internet. The contract was posted by the news site Axios and helped to explain one of the biggest mysteries in the PBM business: how rebates work. You see, to get on a PBM’s list (or formulary), drug companies offer rebates on drugs to clients in their contracts. No two contracts are the same, and they are very secret, so we learned a lot. We have learned Express Scripts has a seriously loose definition of “rebate.” We have learned it can collect all kinds of fees from drug companies on top of rebates. We have learned it can negotiate rebates for itself and keep a portion of the rebates you may think would go back to the client (you) for itself. In other words, you’re playing in Express Scripts’ house, and the house always wins. It’s not as if no one has noticed this. It’s just that PBMs guard their secrets zealously. Pharmacists, for example, sign agreements that do not allow them to tell a customer when buying a drug with cash would actually be cheaper than paying for it through their healthcare plan. This is known as a “gag order,” in part perhaps because that’s what it should make any reasonable capitalist want to do. One time, someone almost let the secret of the PBMs’ brutal business out of the bag. It was Heather Bresch, the CEO of Mylan, the maker of the life-saving EpiPen. You may recall that in the summer of 2016 Bresch was in trouble for jacking up the price of the pen by 500% over a couple of years to about $US600 for a pack of two. While Bresch was on her “sorry, not sorry” media tour, she made an appearance on CNBC that almost gave the game up. She said that Mylan gets only $US275 for every EpiPen device and that the system “incentivizes higher prices” as it passes through several hands to get to the patient. She called for transparency and for all the players, with an emphasis on PBMs and their secretive rebates, to go to the table. Less than a month later while testifying before Congress, Rep. Earl “Buddy” Carter of Georgia – the only pharmacist in Congress – pressed Bresch on her relationship with PBMs and repeated her call for transparency and changed the subject. “You know I know better than that,” Carter said, explaining that if Mylan had cut the list price of its drug in the first place, it wouldn’t have received rebates from the PBMs. Carter asked Bresch to follow up with more details about Mylan’s contracts with PBMs. No one in big pharma seems to really want to do that, and lawmakers in Washington have just recently started asking the PBMs why they hold so much sway over drug companies. In a recent interview with Business Insider after he introduced legislation to end gag clauses (similar bipartisan legislation was also recently introduced in the Senate), Carter explained why. That is to say, the PBMs are fond of their power and will not let us wrest it from them with ease. Carter, who also said the Federal Trade Commission needed to intervene, is very blunt. Rep. Doug Collins of Georgia, a member of House Speaker Ryan’s leadership team, is less so, but you’ll get his point. “In light of the chronic mischief that PBMs create at the expense of patients and the community pharmacies that serve them, we continue to be concerned about the impact of consolidation in the healthcare industry on market concentration and competition,” he told Business Insider. Us too. That’s why none of these mergers should happen – not for $US54 billion, not for $US68 billion, not for all the money in the world. It’s just not worth losing control of the entire system.